For my family, the RNLI has always been a very special organisation. From the moment I first tentatively took the tiller of our little Mirror dinghy with the bright orange sails, it was clear to me that the sea could be a dangerous place – and worthy of our respect. But an even greater respect was due to those who would voluntarily set out onto it, often in the very worst conditions, to help others in distress. With my Dad working with the RNLI on the coast (and me sometimes tagging along), I soon became aware of the effort that went into keeping the lifeboats and their crews ready to launch. But the more I visit other stations with ‘the little guys’ and the more I get involved with our own local station here at Portishead, the more amazed I become by quite how many people give so freely of their time and their skills in support of this unique organisation. While even the most casual of observers would recognise that a lifeboat needs a crew, it often comes as a surprise that the operational crew may number in the twenties, each of whom gives up his or her time for regular training, as well as periodic courses at headquarters in Poole or elsewhere. And then there are the ‘shouts’, which can come at any time or day or night and require an immediate response. And when the pagers go off, it’s not just the ‘boat crew’ who respond. Tractor drivers, shore crew and marshals are also vital if the boat is to be launched quickly and safely. And these volunteers likewise have their own programme of training (for all of which, incidentally, we have the station’s training officer to thank), even though some of them will be members of the boat crew, too. Behind the scenes, there’s even more going on. Each station’s Lifeboat Operations Manager (LOM) performs a herculean task in keeping the operational side of things up and running. 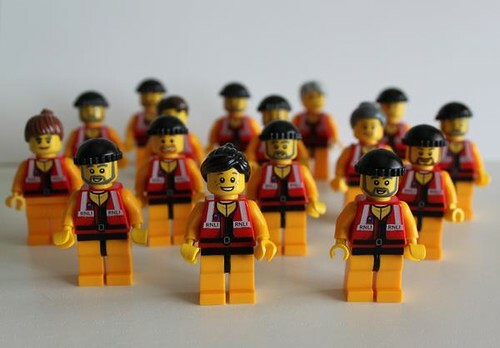 And both he/she and his/her team of Deputy Launch Authorities (DLAs) have the unenviable job of responding to alerts from the Coastguard and making the sometimes difficult decision of whether or not the lifeboat should launch. Staying with the station itself, the wider role of the lifeboat station and the local community is the purview of the Lifeboat Management Group (LMG). Each station will also have its own Lifeboat Press Officer (LPO), who works tirelessly to promote the station’s work and to ensure that essential messages are communicated clearly and effectively in both mainstream and social media. And the Lifeboat Administrative Officer (LAO) and his or her team performs an equally vital role. And lifeboats are expensive to develop, build and run. So fundraising also plays a huge role for any lifeboat station, with everyone (and I mean everyone) getting involved on a regular basis. All stations have a fundraising branch or similar group of fundraising volunteers, who work with the rest of the station staff to organise seemingly endless open days, fetes, collections, sponsored walks and the myriad of other activities that keep the charity, literally and metaphorically, afloat. It’s not just stations that have fundraising branches, though. Virtually every town or village that I’ve ever been to across the UK, regardless of how near to or far from the coast, has its own team of fundraising volunteers. And they all work tirelessly to raise awareness of the work of our crews (and lifeguards, of course) and the funds that they need to keep going. I could go on and on. I could talk about our station visits officers, who manage the daily flow of local people and groups in and out of the lifeboat station, or our education volunteers, who head out into the community to spread the word on coastal safety. I could talk about the volunteers who run our souvenir shops. I could talk about the many lifeguards around the coast, who help to keep our beaches safe. I could talk about the local employers who support our work, not least by being so understanding when members of the crew, pagers blaring, have to depart in a hurry. And I could talk about everyone who has ever dropped a few coins into a collection bucket or remembered the RNLI in their will. It sounds a bit of a cliche, but it’s true. Without all of these people, the RNLI would not be the organisation that it is today. Without their support, our crews would not be able to launch their boats. Without their commitment, we would not be able to help those in distress. A very special organisation, yes. But also a very special group of people. A very special family.